I recently saw The Conjuring 2, and in my review I discussed how sometimes even the most conventional films can still be good, and I argued that conventionality can sometimes come hand in hand with reliability. The Secret Life of Pets, as cute and fluffy as it may be, is an almost complete counter to that argument. When Max (Louis C.K.) is faced with the eventuality of having a new dog, Duke (Eric Stonestreet), move in with him, he isn't particularly pleased. Soon, the two of them are unintentionally thrust far away from home, and must journey back together by putting their differences aside. If it sounds a lot like Toy Story, that's because it is basically Toy Story, just, y'know, without the heart and the humour and the soul and the characters and the innovative animation. This is about as rote and stale as animated cinema can be. The Secret Life of Pets is about as frustrating as film can be. 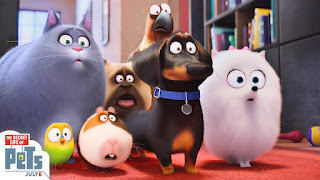 The first trailer for this was ingenious: it showed a wide array of pets getting up to fun and amusing stuff while their owners were away, and it set the film up to be a clever, almost Pixar-esque insight into a world that we humans don't get to see. The film then bizarrely chooses to sidestep all of this. It begins with a montage that is almost shot for shot identical to the first teaser, then moves like lightning to get the characters out of the house. The quick pace keeps the thin story moving nicely, but it also skims right over the one part of the film that has potential. Instead, we're thrown into a plain and dull story about two dogs learning to put their differences aside, but the themes are so tired and the narrative so well worn that none of it comes together. There's a brief sub plot in the middle focusing on Duke's previous owner, but rather than settle for something touching and character driven, the film again bypasses it to keep the central story moving. It's almost as if the film makers worked out all that could be good, and chose not to go down that path. Not every animated film needs to be game changing though. We don't need every animated film to be as conceptually daring as Wall-E or as emotionally charged as Up. In fact, The Secret Life of Pets' complete disregard of this wouldn't really matter if it were at least a solid film in its own right. But it just isn't. The characters are irritating and unlikable, the humour consistently falls entirely flat, the story telling is completely botched in the conclusion, and it moves at such a fast pace that it misses out on any potentially good moments. If the film has an upside, it's that it truly makes you appreciate the thought and the love and the effort that goes into the likes of Inside Out or How to Train Your Dragon 2 or Zootropolis. Without this care, animated films become little more than brightly coloured spectacles for kids that simply fall flat on every other level. The Secret Life of Pets throws away all its potential from the offset, and it soon feels like a cheap knock-off straight to DVD release that somehow found its way into the multiplex. It didn't need to be game changing, but when you hit the midway point and realise that you really wouldn't care if any of these animal characters got impounded there and then, it's never really a good sign. To Summarise: Severely lacking in heart, humour, and even the most basic principles of film making, The Secret Life of Pets works well to entertain the kids but has nothing going on beyond the visually pleasing animation.